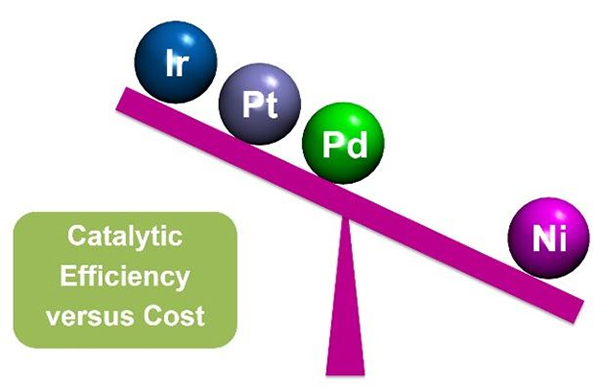 Comparing the cost-performance advantage of nickel-based catalysts to three industry-standard precious metals used today: iridium, platinum, and palladium. Image courtesy Varinia Bernales Enlarge Image. This article, written by Timothy Plett and Varinia Bernales, appeared in the Spring 2016 issue of Frontiers in Energy Research, an online newsletter that supplies news and information about the Energy Frontier Research Centers. Subscribe at www.energyfrontier.us/newsletter. Affordability is one of the greatest challenges to the spread of catalyst-based energy technologies. The main reason is the reliance on precious metals, such as platinum, whose market value is ~$950 an ounce. In industry, platinum-containing catalysts dramatically enhance the speed of different reactions to make a variety of fuel sources viable for harvesting energy. Scientists at two Energy Frontier Research Centers (EFRCs), the Center for Molecular Electrocatalysis (CME) and the Inorganometallic Catalyst Design Center (ICDC), have made advancements in developing nickel-based catalysts. Nickel, whose market price of less than $4 a pound, is an attractive alternative to expensive and rare metals. A roadmap for optimizing designer catalysts. In nature, enzymes-biological catalysts-have evolved to help enable reactions essential to life-giving processes. Some of these processes require a large amount of energy or they will not occur under normal conditions. Catalysts open up a new route for a reaction, like taking the easier route through the mountains rather than climbing the tall peaks. Catalysts are chemicals or structures that make unlikely reactions possible, such as helping two molecules bind together. While catalysts are produced commercially for many different reactions, a major challenge is tailoring a catalyst to a specific reaction, a process we refer to as optimization. Part A demonstrates how EECC and ECEC cycles overlap during the production of hydrogen gas by a nickel catalyst. Part B illustrates how computer modeling can predict the electrochemical reaction behavior of the different pathways individually and how they would act together in conditions where the pathways compete. Copyright: American Chemical Society 2016 Enlarge Image. Scientists at CME are working on optimizing the reaction pathways nickel-based catalysts should follow. They are tackling this challenge in the context of producing hydrogen gas. A group led by Simone Raugei used computer modeling and simulation to investigate the plethora of possible reaction pathways. In complementary work, Eric Wiedner led another CME group that employed electrochemical analysis to clarify what step sequence was followed in producing hydrogen. The result of their synergistic effort was a comprehensive energy road map of all the possible reactions to get to the final destination of producing hydrogen gas. In the "energy road map," they detailed all the thermodynamics and kinetics; that is, the probabilistic energy distributions and motion-dependence of each potential route. This works similar to a traffic overlay on a map: the thermodynamics and kinetics, like the colors on a traffic overlay, will tell you which route is most efficient to get you home. For a catalyst to produce hydrogen gas, both electrical charge, in the form of electrons, and chemical components, in the form of protons, must be transferred. We refer to the electron transfer as an "E" step and the proton transfer as a "C" step. When producing hydrogen gas, the reaction needs two E steps and two C steps. Because we know kinetics matter, finding the right pathway is crucial, and much of it comes down to which step should be taken first. Two potential pathways were proposed: ECEC and EECC. The CME teams modeled these cycles using a nickel-based catalyst and a chemical source of protons. They looked at the kinetics of both reaction pathways using their modeling approach. 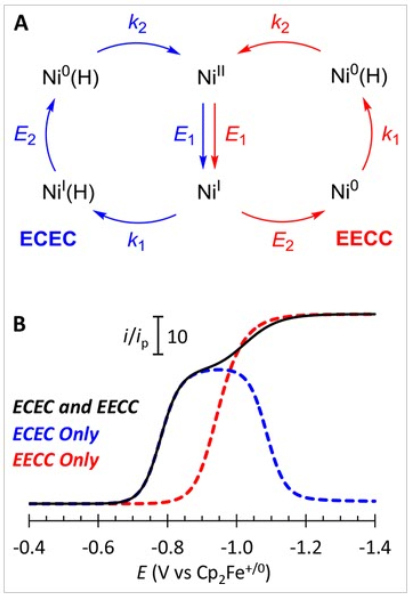 The scientists showed that the EECC reaction pathway was faster because of the chemistry happening on the nickel catalyst, but the ECEC reaction pathway was more energy efficient. What this means is that the catalytic energy road map allowed the CME scientists to predict how to change reaction conditions to maximize the reaction rate or energy efficiency. Their methods provide a basis for calculations on other catalysts and, in general, help contribute to designing better catalysts. Controlling catalyst design: Decorated metal-organic frameworks. Part of creating a successful catalyst is having an efficient scaffold to mount it on. A class of materials known as metal-organic frameworks (MOFs) represents an ideal platform to locate single-site metal catalysts to increase the performance of well-established molecular catalysts. MOFs are porous materials formed from two types of building blocks: metal oxide clusters (nodes) and organic molecules that bridge the clusters. The variety of possible combinations of these blocks allows scientists to design and then tune properties such as stability and porosity to create ideal binding sites; that is, specific locations where the reaction takes place. In early work, a team of experimental and computational scientists from the ICDC looked at three MOFs, named UiO-66, UiO-67, and NU-1000, decorated with single iridium atoms. The goal was to connect the influence of binding site design in the MOF with the catalytic performance of the iridium-containing catalyst. To control the anchoring site for the metal catalyst, they introduced defects, or imperfections, into the MOF's nodes. To measure the catalytic activity of the newly modified MOF, the team used light absorbance over a wide spectrum to track its properties. During the spectral measurements, the response of one of the iridium-bound groups, a carbonyl group, to changes in environment was found to predict catalytic activity. Based on these results, scientists exploited the spectral data to still further improve their control over engineered catalyst construction. Once the effect of the MOF platform on the anchored catalyst was identified, a different team from ICDC used it for a nickel catalyst. The MOF they used was NU-1000, which has pores about three times larger than the UiO MOFs. To install nickel in NU-1000, the team used the atomic layer deposition in MOF (AIM) technique to coat the interior reactive surfaces of the MOF with the metal catalyst. After deposition, a technique that measures the absorbance of X-ray frequencies confirmed that nickel only localized at reactive sites in NU-1000, marking this as the first time AIM incorporated a nickel compound into a MOF. Furthermore, the regular distribution of nickel through the MOF made the new catalyst optimized for higher performance. After activation of the new nickel-decorated MOF catalyst, the team compared it side-by-side with a standard platinum catalyst performing the same chemical reaction: the hydrogenation of ethylene; that is, adding hydrogen to another molecule. They found that, under an otherwise inert, non-reactive atmosphere, the nickel catalyst performed at a rate that made it significantly more cost effective than the platinum. Nickel performed at a turnover rate of one molecule per binding site every second, while platinum reacts at a rate of about 35 per second. Although platinum is more efficient in terms of speed, the performance of the nickel is a significant gain in cost efficiency for this reaction, because platinum is more than 1000 times more expensive than nickel. Platinum today, nickel tomorrow? The industry standard is platinum catalysts, and it likely will be for a little longer yet. However, the advances made by these EFRCs in understanding principles and design point the way to tailor-making new catalysts with properties that may make them more economical than the ones used today. Li et al. OKF, JTH, CJC, AV, JLF, JAL, and LG gratefully acknowledge the financial support from the Inorganometallic Catalyst Design Center, an Energy Frontier Research Center (EFRC) funded by the U.S. Department of Energy (DOE), Office of Basic Energy Sciences. The work was performed at the Pacific Northwest National Laboratory, operated by Battelle for DOE. AWP was supported by the Department of Defense through the National Defense Science and Engineering Fellowship program. JTM and AG were supported by the DOE, Office of Science, Office of Basic Energy Sciences, Chemical Sciences, Geosciences, and Biosciences Division. This work made use of the JB Cohen X-ray Diffraction Facility supported by the Materials Research Science and Engineering Center (MRSEC) program of the National Science Foundation at the Materials Research Center (MRC) of Northwestern University; the EPIC facility (NUANCE Center-Northwestern University), which has received support from the MRSEC program at the MRC, the International Institute for Nanotechnology (IIN), and the State of Illinois, through the IIN; IMSERC facilities at Northwestern University supported by the National Institutes of Health; and the Advanced Photon Source, supported by the DOE, Office of Science, Office of Basic Energy Sciences. Materials Research Collaborative Access Team (MRCAT) operations are supported by the DOE and the MRCAT member institutions. Raugei et al. This research was supported as part of the Center for Molecular Electrocatalysis, an EFRC funded by the DOE, Office of Science, Office of Basic Energy Sciences. Pacific Northwest National Laboratory is operated by Battelle for the DOE. Wiedner et al. This research was supported as part of the Center for Molecular Electrocatalysis, an EFRC funded by the DOE, Office of Science, Office of Basic Energy Sciences. Pacific Northwest National Laboratory is operated by Battelle for DOE. Yang et al. This work was supported as part of the Inorganometallic Catalyst Design Center, an EFRC funded by the DOE, Office of Science, Office of Basic Energy Sciences. The authors acknowledge the Minnesota Supercomputing Institute at the University of Minnesota for providing the computational resources.